1. Cut the potatoes into halves or quarters depending on their size and steam until just cooked through. 2. Prepare the haricot vert and steam until just cooked, rinse with cold water and drain. 3. 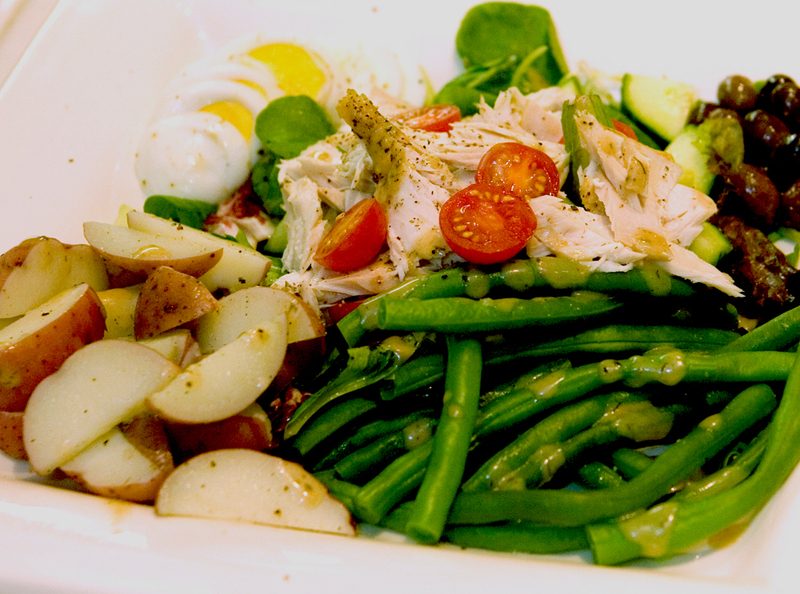 Place the prepared lettuce, potatoes, haricot vert and tomatoes and anchovy if using into a large bowl. 4. Toss with a generous amount of Dulcet Lemon, Mustard & Dill Sauce and freshly ground black pepper. 5. Arrange the tuna, eggs and olives onto the salad, and drizzle additional dressing. From our test kitchen: A fillet of seared Ahi tuna can be substituted for the albacore. Sear the tuna, slice and fan over salad.